Get visibly whiter teeth in just 30 minutes a day! 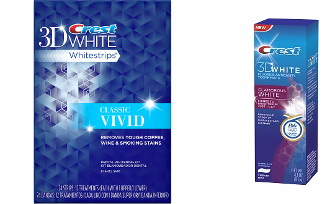 Crest 3D White Whitestrips Vivid are clinically proven to whiten teeth, and are perfect for those new to teeth whitening. These enamel-safe teeth whitening strips give you visibly whiter teeth with noticeable results in just 12 days. Satisfaction is guaranteed.